A staple of the Japanese arcade game scene, Border Break features heavy-duty mechs fighting for victory in all-out, robotic-battle action! 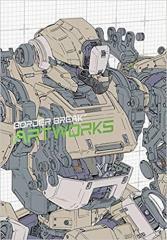 Now, the outstanding mecha designs of this unique video game series are collected in one detailed art book. Included are technical drawings, rough concepts, character art, creator commentary, mech profiles, and more! No true mecha fan would dare miss Border Break Artworks!